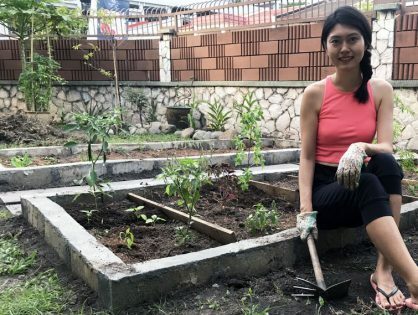 Most modern people have little time and skills to cook healthy food. 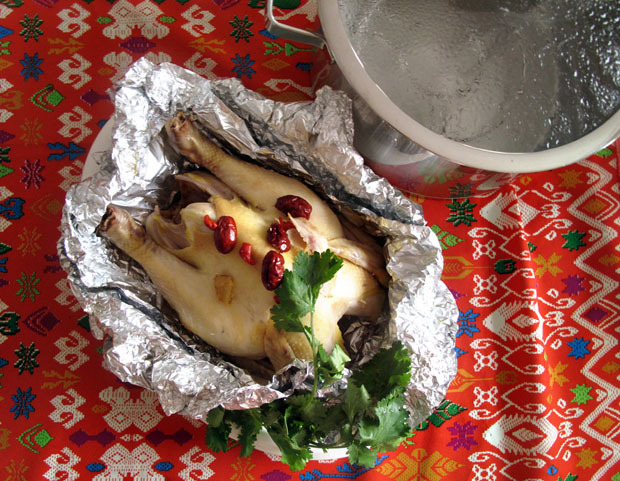 This herbal chicken takes only 2 minutes to prepare and almost fool-proof. 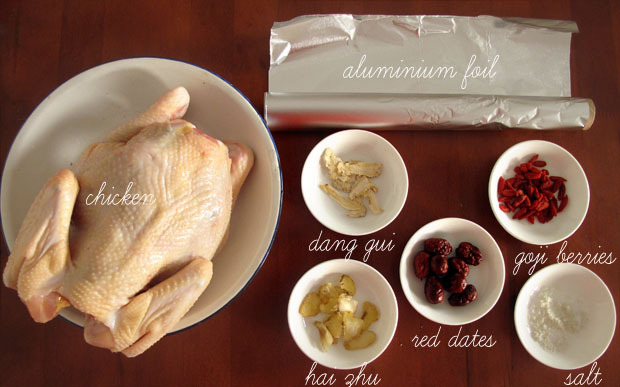 Simply rub salt onto the chicken, stuff common chinese herbs into its cavity and wrap it with aluminium foil. These common herbs are use to regulate health and each of them have plenty of benefits. Red dates is most notable for nourishing blood, dang gui to enhance women’s reproductive system, goji berries for good eye-sight and hai zhu (solomon seal) for moist skin. 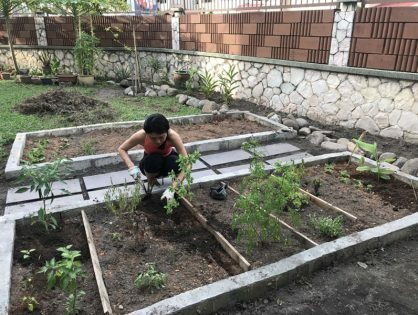 Notes: if you don’t have these herbs at home. Read ‘tips’ below. Salt Rub sea salt onto the chicken. Don’t worry if the chicken is not salty enough. You can always season with soya sauce later. Herbs Stuff washed herbs into the cavity of the chicken. 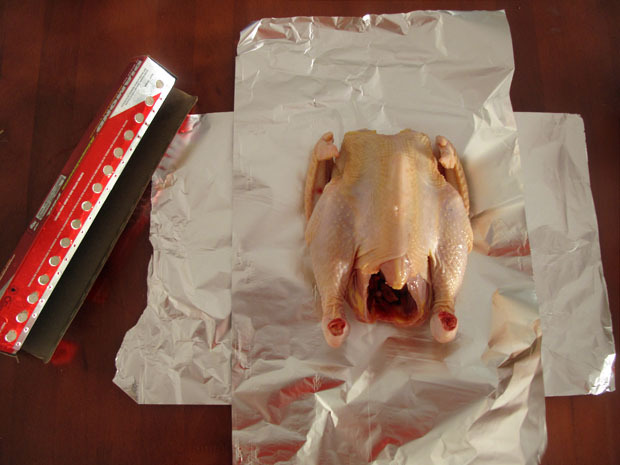 Wrap Carefully wrap chicken in aluminium foil. 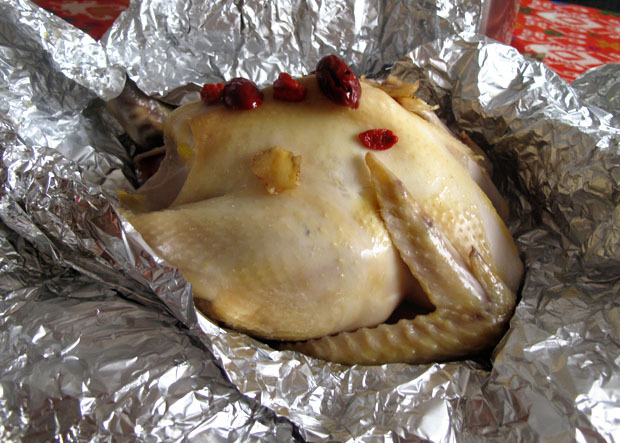 If the foil is not big enough, use two sheet to make a cross to wrap. Steam Steam chicken in medium fire for half an hour. If the chicken is small, it will take less time. To test whether the chicken is cooked, poke it with something long and sharp like a bamboo skewer. If it’s not red, it should be cooked. If you don’t have the herbs, you don’t need to buy them separately. 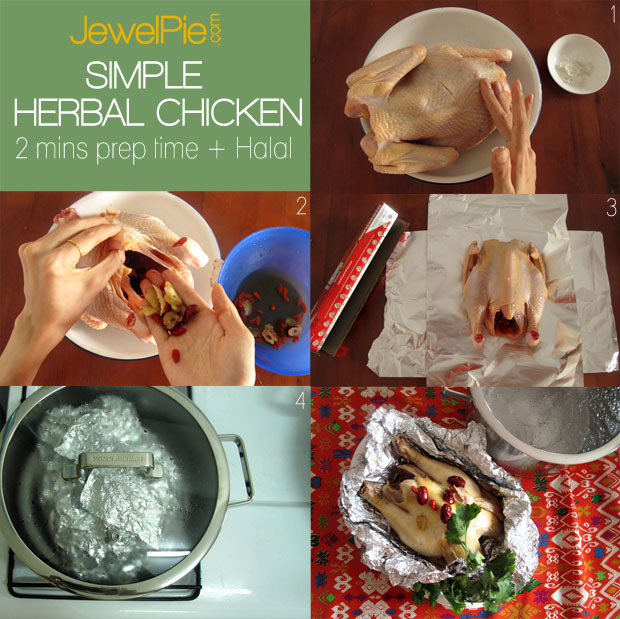 Go to the medicine stall and tell them to pack for you herbs for herbal chicken. Remember to specify it is not for black chicken and you want it to be light and not bitter. Do you have common chinese herbs at home?